George Clooney obviously knows a good magazine when he sees one. He was the subject of a most entertaining TIME cover story written by Joel Stein in 2008 in which we called him "The Last Movie Star." 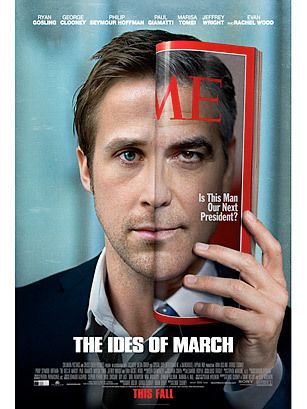 Maybe he's now returning the favor by mocking up an image of himself and co-star Ryan Gosling in this poster for the political drama The Ides of March, which Clooney is also directing. The flick looks set to be in the mix for next year's Oscars: Clooney plays a presidential candidate, with Gosling his press secretary who, according to the synopsis, "finds himself involved in a political scandal that threatens to upend his candidate's shot at the presidency." Rounding out the cast are the always reliable Paul Giamatti, Marisa Tomei and Philip Seymour Hoffman. It's possible that the inspiration for the poster partially came from another 2008 TIME cover, our merging of the faces of then presidential candidates Barack Obama and Hillary Clinton. The headline for that issue read, "There Can Only Be One." When it comes to magazines and Clooney, perhaps that's the case. See more on the George Clooney movie poster featuring a TIME cover.